Clubfoot, also known as talipes equinovarus, is a relatively common congenital malformation occurring in approximately 1:1000 births. 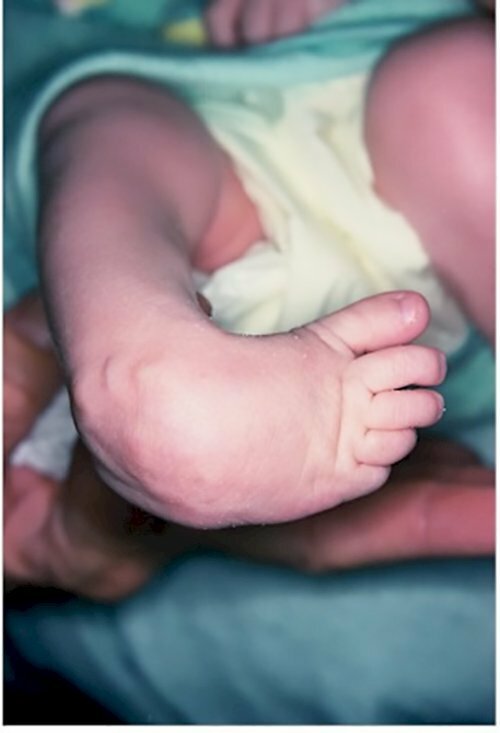 The term talipes equinovarus describes a deformity in which the newborn's foot is poorly developed in relationship to the leg. The Achilles tendon and posterior ankle are contracted, and the foot is inverted and rotated in relationship to the leg. 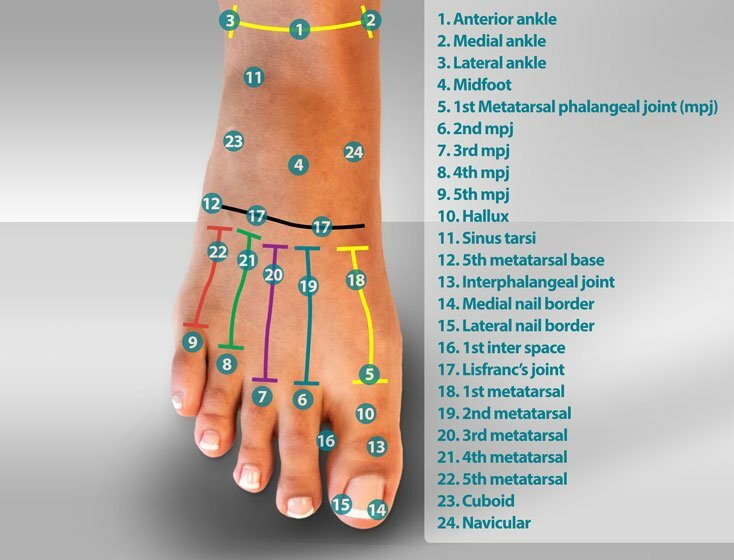 If left untreated, weight bearing would be on the outside of the foot. Clubfoot is seen more in males than females and occurs most commonly in just one, not both feet. Clubfeet are asymptomatic in the non-ambulatory infant. As the child begins to walk, the severity of the clubfoot becomes evident. Fitting of shoes and walking may be difficult. In mild cases, clubfeet can be accommodated with special shoes that limit pain. The disability associated with the adult clubfoot can range from mild to severe. Mild clubfoot deformities are common and many patients are quite functional. Severe deformities can present with significant pain and disability even after early intervention and treatment. Severe clubfoot deformities limit the amount of time a clubfoot patient can stand and walk. Clubfeet are seen 2:1, male to female. If a sibling has a clubfoot (or clubfeet), the incidence rises to 1:35 births for all other siblings. Genetic factors that contribute to clubfeet have not been determined. The reason children are born with clubfeet is not clearly understood. 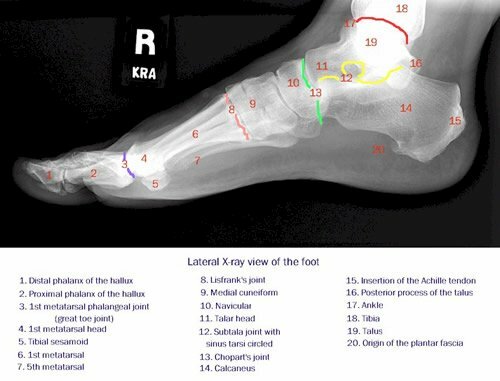 Several authors have speculated that the deformity stems from an underdeveloped bone in the foot called the talus. As the talus grows in the young fetus, the bone "unfolds" from an inverted (varus) position. This unfolding process seems to occur by the neck of the talus straightening over the first several months of fetal growth. Any disruption of the straightening process may contribute to a delay or arrest of the straightening resulting in a residual inverted (varus) position of the foot. Some authors have speculated that this delay or arrest may be due to a decrease or interruption in the blood flow to the neck of the talus. X-rays taken of the infant clubfoot will show inversion of the talus in relationship to the calcaneus. This classic x-ray view used to evaluate clubfeet is referred to as Kite's Angle. X-ray evaluation of clubfeet includes a comparison of the deformity in relationship to the bones of the lower leg (ankle), the bones of the rearfoot (talus and calcaneus), and the relationship of the rearfoot bones to the forefoot. Most children born in developed countries with clubfeet will mature to have full and productive lives. An adult who was treated as a child for clubfeet will show characteristic findings of the lower extremity. These findings include a thin calf, called a stork deformity. A characteristic "C" shaped foot is also common as a result of under-treated metatarsus adductus. Unfortunately, many cases of untreated clubfeet in adults can be seen in underdeveloped countries throughout the world. The child or adult with an untreated clubfoot will spend a lifetime walking on the outside of their foot. Due to this deformity, their lives and occupations will be limited to non-weight bearing activities. Several of the bones of the foot are unique in the clubfoot, and in particular, the talus. A portion of the deformity of a clubfoot involves the internal rotation and plantarflexion of the neck of the talus. As the neck of the talus adducts, it places the articular surface of the talo navicular joint in a more medial position, therefore increasing the internal position of the foot (varus.) Also as a result of the varus position of the talus, a portion of the anterior talus lies displaced anterior, or in front of the ankle. This anterior displacement contributes to the contracture of the soft tissue structures of the posterior ankle, including the ankle capsule and tendons crossing the ankle joint such as the Achilles tendon.The articular surface of the subtalar joint may be medially deviated. Many of the soft tissue structures of the ankle and midfoot can be altered in a clubfoot. 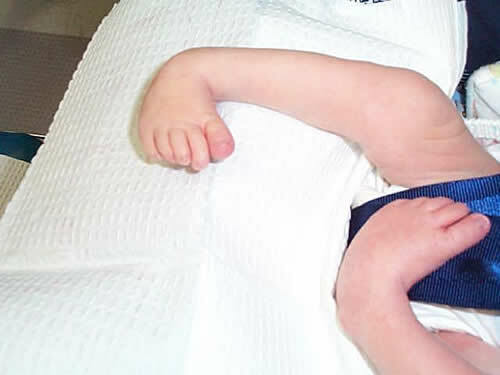 It is not fully understood whether the contraction of the soft tissue structures is a primary deformity or secondary to some of the previously mentioned osseous deformities. At the level of the ankle, the joint capsule and tendons crossing the joint are contracted, creating a varus position of the foot. 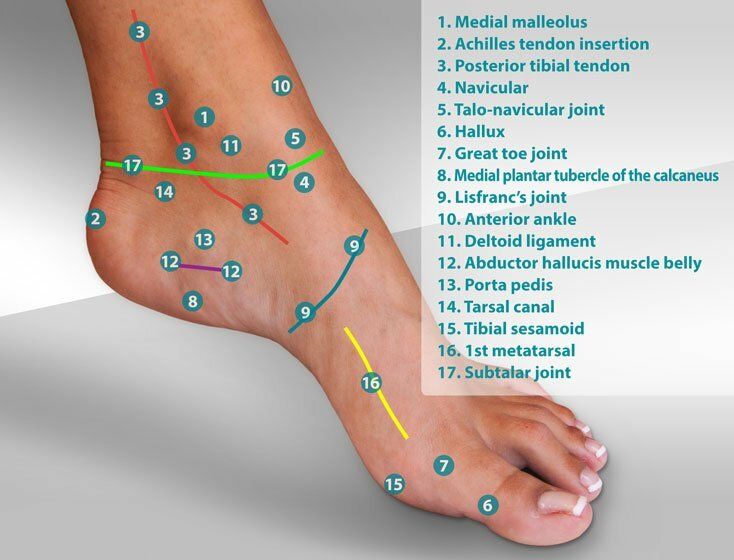 The structures of the posterior ankle are also contracted. Structures of the midfoot are also affected by a clubfoot deformity. The navicular is smaller in most cases of clubfoot and articulates with the talus in a medially displaced position relative to the long axis of the talar body. The worse the change in the talus, the greater the inversion of the midfoot and forefoot. 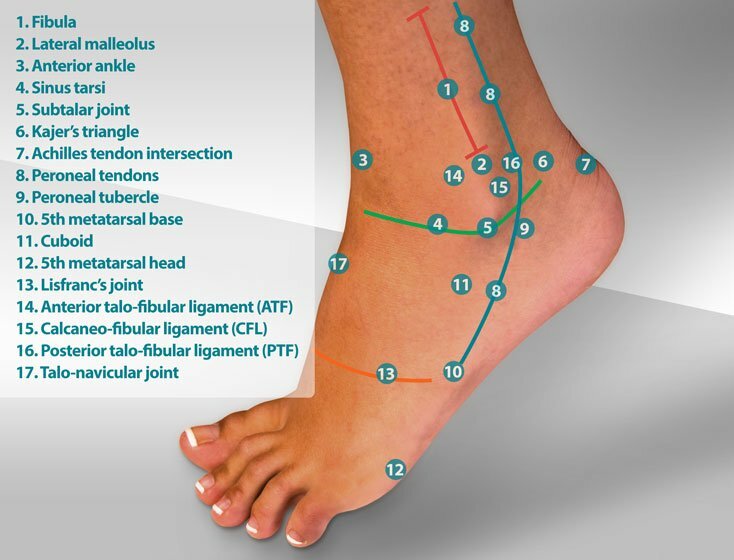 The deltoid ligament, posterior tibial tendon, long flexor tendons, and other structures of the medial ankle and foot will also show contraction deformities in relationship to the degree of deformity of the talar neck. Causes and contributing factors for clubfoot have not been determined. There is no differential diagnosis for clubfoot. The foot of a newborn is merely the size of an adult thumb. As the foot matures, the development of the bones and joints become rigid and less flexible. Therefore, the earlier treatment is initiated, the better the potential for a good outcome. Treatment of clubfoot may be conservative, surgical or a combination of both. The decision as to which method of treatment depends upon the severity of the deformity and the previous experience of the treating physician. Manipulation and casting are commonly used as conservative measures in treating neonatal clubfoot. Based on its success, the Ponseti method of manipulation has grown to be a very popular method of conservative care. 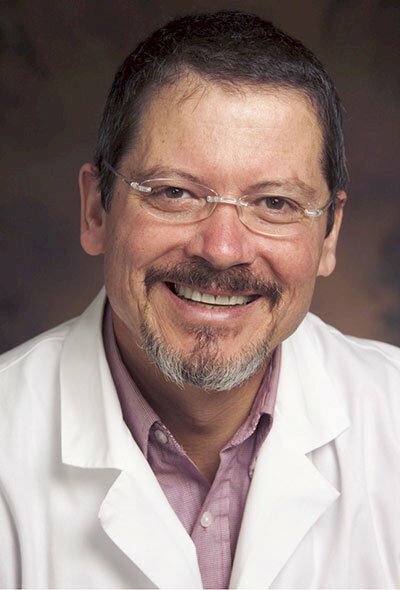 Established by Ignacio V. Ponseti, MD in the mid-1940's at The University of Iowa, the success of the Ponseti technique has significantly reduced the use of surgery in clubfoot patients. Parents are instructed by their physician in techniques that will help to correct the contraction of the posterior and medial ankle and foot. Manipulation may be reinforced by the use of casts or braces. Several new, removable braces have been developed in the past decade that have virtually eliminated the need for plaster or fiberglass casting (for additional information see The Wheaton Brace Company.) It is not unusual for the clubfoot deformity to be corrected within the first 2-3 months of life. Most importantly, the correction must be maintained with splints, braces, and corrective shoes. Should three or four months of stretching, manipulation, and casting not reduce the clubfoot, surgical correction may be indicated. 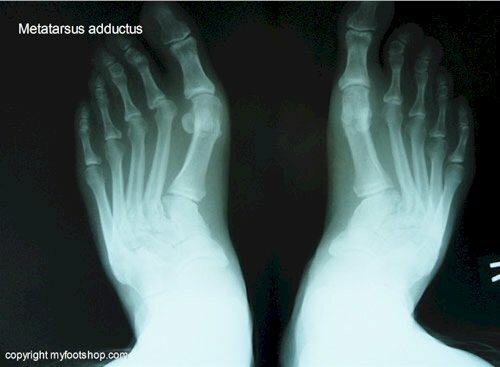 The most frequent deformity left following a period of conservative care is the rearfoot deformity of inversion (varus) and plantarflexion (equinus.) Metatarsus adductus, on the other hand, seems to be much more easily reduced by conservative care. Surgical release of the posterior and medial compartments will usually correct the residual rearfoot deformities. After the age of two, the deformities of a clubfoot become much more difficult to manage due to thickening and fibrosis of the soft tissue structures of the posterior and medial ankle and foot. Most of the procedures used to treat clubfoot in a child older than 4 years include some modification or fusion of the bony structures of the foot. Although most clubfeet in developed countries are treated when the patient is an infant, many residual deformities of clubfeet carry over into the adult foot. Residual metatarsus adductus, calcaneal varus, and inversion of the foot are common. Clubfoot deformity also leads to early degenerative arthritis of the foot. Treatment of clubfeet requires specialized care. Contact your podiatrist, orthopedist or family doctor with all questions regarding infant and adult clubfeet. Club Feet by Myfootshop.com is licensed under a Creative Commons Attribution-NonCommercial 3.0 Unported License. 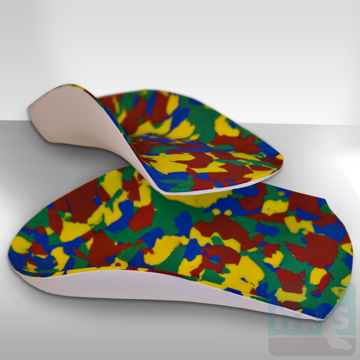 The UCBL Preform Children's Orthotic is a rigid shoe insert that treats flexible flat feet and pronation in early walkers and children up to 5 years of age. It's a great arch support and heel stabilizer for toddlers! By PediFix. 1 pair/pkg. This is a discontinued item.